Tax cuts actually threaten to exacerbate the crisis, not solve it. While few CEOs dare admit it, government spending actually is the best way for corporations to externalize many of their costs: health care, education, social stability and perhaps most obviously, physical infrastructure. A CCPA study released last January concluded that Canada would have to spend $30 billion a year for the next decade to bring infrastructure spending back to historic levels. Ottawa accounted for 34 percent of such spending in 1955 in the days when our current infrastructure was being built. But by 2003 it was down to 13 percent. The Tyee is your independent daily online magazine reaching every corner of BC and beyond. The Friedman ideology led directly to the first 9/11. I usually refer to the NYC 9/11 as the second one because by a strange quirk of historical coincidence, 9/11 1973 was the date the CIA overthrew Allende in Chile and it is widely agreed that the Friedman ideology was at the root of that coup by Pinochet. If you look at Canada’s debt you will find that after many decades of relatively minor ups and downs, the debt took off geometrically in 1976 and has seldom reversed its growth since then. This too results from the Friedman economic ideology. Few have looked at what changed in the mid seventies to cause this explosive growth in the debt. 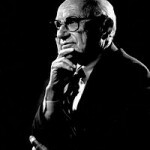 For those interested in more about Friedman (and how debt arose from his policies) check out some recent articles in ER (Economic Reform) at . The University of Chicago is proposing a throne from which Friedmanites can preach their gospel and an economist has published his objections to that plan in ER.